MIT’s One Broadway Building to be the future home of Brothers Marketplace. 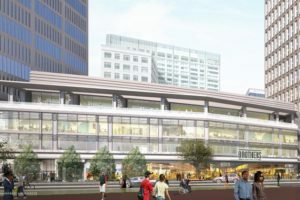 A grocery store was the most requested retail use specified by neighborhood residents, local employees, and students during the zoning process for MIT’s Kendall Square development. The 19,000-square-foot Brothers Marketplace is expected to open in summer 2019. The ground floor of One Broadway is currently under construction to make room for the future grocer, as well as a repositioned lobby, a restaurant, and a new home for Dunkin Donuts. The One Broadway renovations are part of a larger development at the site, which will include 300 residential units and an additional 12,800 square feet of retail.